When I started my floral company 14 years ago, I naively thought each wedding would include a unique combination of colors, styles and flowers. I quickly learned that what is in style in fashion and home decor has a strong influence on what brides choose for their ceremony and reception decor. Sure, it was different then. Brides brought in scrapbooks of little clippings from wedding planning books, sometimes even photos from a friend’s wedding for inspiration. Today, brides show me their Pinterest boards. But no matter where inspiration came from, themes persist through each wedding season, and some trends last longer than others. What is most popular in today’s weddings are leafy, neutral and bohemian themes. Maybe you want to be on trend and follow the latest fad, but this is an opportunity for you to create a day totally your own. Don’t feel limited by anyone else’s ideas, and instead make your wedding a special reflection of you as a couple. They say never to get rid of your bellbottoms because they will eventually make a comeback. The same is true of wedding styles. Cascading bridal bouquets are back in a big way, as are large bouquets in general. And if a cascading bouquet isn’t your first choice, you might prefer a generally round design with cascading elements. The more greenery the better. Pantone Color Institute’s color of the year for 2017 was Greenery — a fresh yellow-green shade — and weddings followed this trend. Eucalyptus of all kinds is very popular as well, and it provides the perfect muted, silvery-green hue that compliments neutral tones beautifully. There are at least five eucalyptus varieties that are well suited for various purposes, so if one happens to be unavailable, there are easy substitutions. Eucalyptus has a slight fragrance most people find pleasant, but it can bother allergies, so use with caution. I also love to use Italian ruscus for its rich green hue and trailing properties. While ladies’ flowers are being sized up, the flowers for gentlemen are being sized down. Boutonniere simply means “buttonhole” in French, and I have never been a fan of large pieces. It should be as simple as a basic adornment on the button hole on the lapel, or in the case of only a vest or suspenders, where the buttonhole would usually be. Greenery is popular, especially paired with small flowers. You can dress up the groom’s boutonniere by incorporating an additional flower or two from the bridal bouquet. For mothers and grandmothers, pin or wrist corsages are the traditional choice, but don’t forget about nosegays. A nosegay is simply a very petite, hand-tied bouquet, and in its original sense means “happy nose” because years ago, fragrant flowers were used to mask foul body odor. It’s perfect for moms who don’t want flowers pinned to their outfit but still want a little something for photos. Gone are tiaras and headbands, and in are hair flowers and floral crowns. Hair flowers should match the bridal bouquet, and your florist should wire and tape the stems for stability and easy insertion into your hairstyle. Resist the urge to pick up hair flowers early in the wedding day, as these pieces won’t stay fresh for long. Garlands, garlands, garlands. They are everywhere. Also a centerpiece option, they are a popular choice for ceremony décor. They can be draped from a tree, arranged in rings and hung from a backdrop or hung from the ceiling and lighting fixtures. 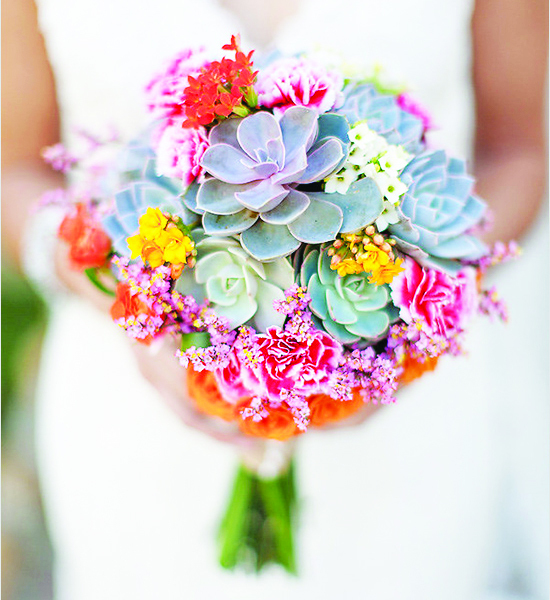 Of course, they pair beautifully with a bridal party full of greenery-heavy bouquets. If your florist is frugal, they can also be repurposed from the ceremony to be used at the reception, and with some added flowers the look is definitely on-trend. A long line of garlands can also be draped from the rows of chairs or pews, or smaller, individual pieces can be attached to the chairs. And although greenery is generally more cost effective than flowers, it takes a lot of product to create these pieces, and they are put together by hand, so budget a reasonable amount to fund these designs. Arches, arbors and gazebos are nice choices for a ceremony backdrop and are beautiful when draped with garlands or a mass of fresh flowers. You will find bohemian touches here as well with added macramé and reclaimed wood structures. Fresh petals in pastel tones lining the aisle is also a nice decor element. Another recent trend is artsy signs, often made of wood, a mirror or a traditional frame and adorned with the names of the bride and groom and wedding date or a welcoming phrase for guests. We love to decorate them with flowers and greenery, and then the sign can be displayed in the couple’s home following the wedding. Greenery also plays a big part in reception decor. Banquet tables (rectangular shaped) with a garland down the center of the table is an on-trend option, with candles and flowers added if desired. If you are using round tables, forgo the garland for a cluster of greenery and flowers, with floating candles or candelabra in the center. Although traditional tall centerpieces may not be the most popular, they are a beautiful option if your venue has high ceilings and you want to compliment the space. These designs can still emphasize greenery, and I often use them mixed with low floral and greenery designs. In order to avoid a claustrophobic vibe at your reception, limit tall designs to half the tables or less, and be sure the bulk of the design is well above eye height. The height of lower floral and candle designs should also be considered, staying low enough for guests to make connections above these designs. Don’t forget to check with your venue to see if candles are allowed. Most venues in Allen County will allow flames within a chimney, and experienced florists in the area will be aware of these policies. However, most barn rentals do not allow for any type of candles. Flameless candles are an option in this case, but be sure to display them in opaque glassware. I haven’t seen a traditional bride and groom cake figurine in many years. I don’t miss them. But floral accents have increased in popularity, along with metallic Love, Mr. & Mrs. or monogram toppers. These pieces can be customized and are an elegant alternative to traditional options; they also work well with floral designs. A domed cake topper of coordinating florals can add the perfect amount of color and texture to an otherwise simple cake. Or a few elegant blooms placed here and there can show off a more intricate cake design. If you opt for a cake from a local box store or a friend offers to make the cake, a safe bet would be to plan for a simple cake and dress is up with fresh florals. But don’t forget the logistics of placing cake flowers. It’s best to get these stems from your florist so they will coordinate with other arrangements. Some bakeries will not even consider placing cake flowers, while others are experienced with cake floral arrangements. I prefer that the florist manages this process, as these are often complicated designs that require floral expertise.